Stay in an air-conditioned tent at Tiger Machan, which is 1.5 km from Rathambore National Park. With the wild jungle on one side, the property has its own restaurant. Sawai Madhopur Railway Station is 12 km from Tiger Machan while the nearest airport is Jaipur, which is approximately 160 km away. Luxury tents at Tiger Machan come with an en suite bathroom with hot shower and toilet. 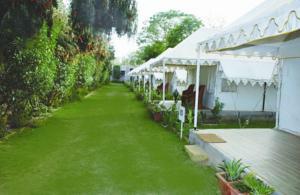 Each tent has wooden flooring, rugs and wood furnishings. A seating area and work desk are included. Observe wildlife at the National Park on a jeep safari accompanied by a trained guide. Other activities such as nature walks and village excursions are available. Tiger Machan camp also offers laundry and massage services at an extra cost. Choose from Indian, European or Chinese dishes at the camp’s restaurant. Dine outdoors under the stars around a bonfire and enjoy live entertainment. Free! One child under 5 years stays free of charge when using existing beds. One older child or adult is charged INR 2500 per night and person in an extra bed. Maximum capacity of extra beds in a room is 1. There is baby beds in a room is 0 capacity for cots in the room. Any type of extra bed or crib is upon request and needs to be confirmed by the hotel. Supplements will not be calculated automatically in the total costs and have to be paid separately in the hotel.